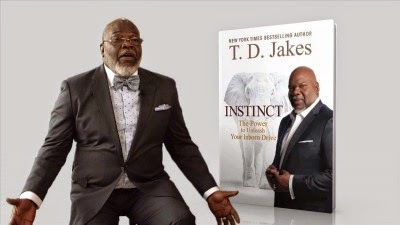 So, you know that I am not a person who watches TV often; however, one night I was flipping through the channels, and I came across T.D Jakes on OWN talking about his new book Instincts with Oprah. Looking at the show that night was like witnessing what happens at many African American churches when people are given a sho' nuff good sermon. People were waving their hands, crying, and shouting. I was totally captivated by listening to T.D. Jakes speak, and I knew that I must read his book titled Instincts. T. D. Jakes opens this book by stating that "Our instincts are the treasure map for our soul's satisfaction. Following our instincts can make the crucial distinction between what we are good at and what we are good for- the fulfillment of our purposeful potential." T.D. Jakes proposes that we all have a natural instinct that tries to guide us if only we would listen. Reading this book, I was excited the entire time, because every word of this book spoke to my heart. It made me think about times when I have been lead by instincts and lead by my emotions. For instance, I have learned, through a very long process, to quiet my mind and see what comes to me, and when I do that, I tend to make decisions that are good for me. However, every now and then, my old self will revisit, and I will make decisions based on my emotions, and I will spend quite a bit of time cleaning up the mess that I made when I was being led by my emotions. I've learned, and is still learning, to sit still and listen to my instincts, otherwise known as the voice of God. Many times my instincts will tell me something that goes against the status quo, and sometimes I have been fearful to state my thoughts or to act, but this book confirms that sometimes our instincts will lead us to uncharted territories, and we must follow if we are to maximize the gifts that God has given to us. We will be evaluated on how we increase what we are given; our natural talents. We must not wait for someone to command us to perform our best and increase our abilities; that must be done intuitively. T.D. Jakes goes on to say that this is not either-or! "You can start a business and keep your career. You can explore your passion for music and start a family. You can remain on the corporate ladder and pursue completing your college degree......"
My next read is Things I Should Have Told My Daughter by Pearl Cleage......Join Me!